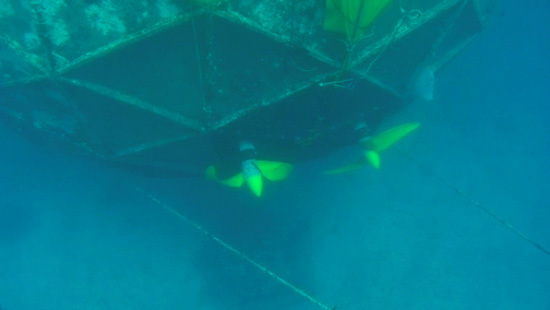 Unlike other open-ocean fish farming cages that are tethered to the sea floor, the Aquapod® is unmoored, able to maneuver and stabilize itself beneath the waves with its own built-in thrusters. Designed by a team led by Cliff Goudey, the director of the MIT Sea Grant's Offshore Aquaculture Engineering Center, a prototype was constructed for a technical feasibility test this summer in the waters off of Puerto Rico. 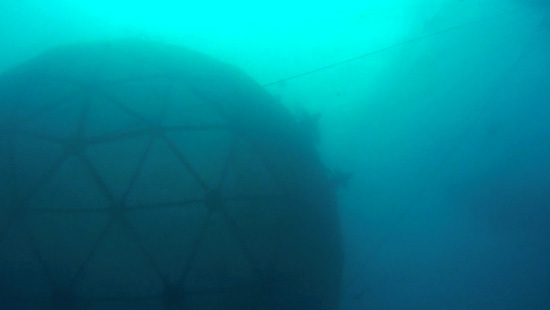 Migratory and geodesic, it perhaps answers the rarely asked question: what would Buckminster Fuller and Archigram have come up with had they taken up underwater agriculture? The project is funded by NOAA’s Marine Aquaculture Program, aimed at demonstrating the technology needed to raise fish in the vast portions of the U.S. [Exclusive Economic Zone] that are too deep for conventional anchored fish cages. 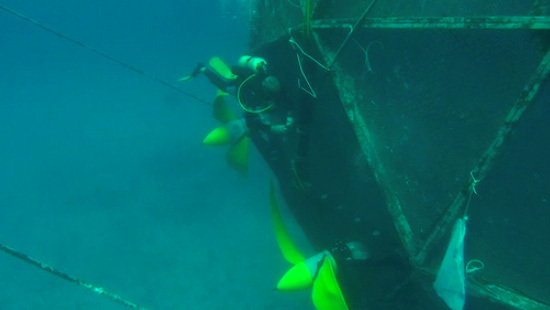 By operating while submerged and in predictable ocean currents, mobile fish farms need only a modest means of positioning to stay within planned trajectories. There are many locations both in U.S. waters and around the world where oceanic currents and gyres offer useful frameworks for such mobile operations. Though futuristic compared to today’s near-shore fish farming practices, the concept avoids the user conflicts and compromised water quality of coastal waters. The concentrated nature of aquaculture often leads to higher than normal levels of fish waste in the water. Fish waste is organic and composed of nutrients necessary in all components of aquatic food webs. In some instances such as nearshore, high-intensity operations, increased waste can adversely affect the environment by decreasing dissolved oxygen levels in the water column. Not only is the quality of the water affected but that of the food as well. Many hatcheries can be found near urban areas and sometimes get exposed to stormwater and industrial runoffs. The risk of contamination is further magnified when cages are tightly concentrated together. This disrupts the natural water circulation that otherwise would take waste out of and bring fresh water into the system. Bred in such close quarters, the fish stocks become even more vulnerable to disease outbreaks and parasite infestation. Off-shore aquaculture, as envisioned by Goudey and others, would resolve these problems, as this approach would 1) take the operation away from the foul waters of the coasts and 2) utilize strong ocean currents to flush away fish wastes. Should the cages enter a less than pristine area, it would simply move again. And if the currents aren't moving fast enough, the propellers would create the necessary turbulence. In any case, as environmentally considerate as the Aquapod® is, that it can propel itself is the one detail that really interest us to no end. Firstly, imagine a swarm of geodesic farms bobbing about in the deep, and inside each one is an entirely different swarm self-organizing in myriad emergent blobs. Secondly, imagine them not simply floating semi-idly but rather orbiting an apparent barycenter, like an underwater solar system of satellite hatcheries revolving around a feeder sphere from which nutrients ooze out and are fling outwards towards awaiting hungry fishes. Put hatchlings in cages into a Caribbean gyre near Barbados. The cages would be tracked by GPS, kept on course with Goudey's propeller system, and visited by feeding boats. The fish, drifting in the gyre, would grow as the current took them west toward the Yucatan, then north into the Gulf of Mexico and finally into the Gulf Stream where the fish could pass near Miami just as they are good-eatin' size. Cages could be timed to arrive monthly or even weekly. It's a vortex within a vortex within a vortex. When I first saw this I thought it was going to tell me that the collective school-movement of the fish would propel it. That would be cool. Thanks for giving everyone a look at the Aquapod and sharing some of the ongoing work we are conducting. You've done a good job highlighting some of its attributes, but I think it is important to point out that the mobile cage detailed here was simply a very short feasability study and there is not in fact an Aquapod wondering the ocean at this point. Hopefully further steps can be taken to develop this method of aquaculture, but until many more challenges are worked out, all fish farming will continue to take place in fixed or moored positions. 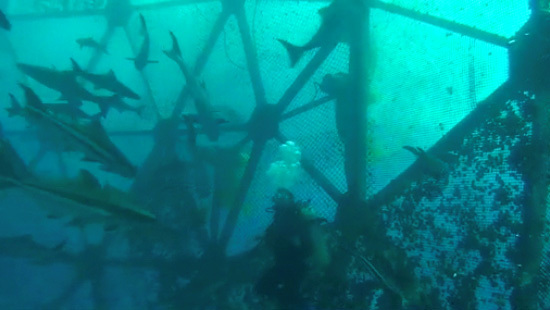 Unlike many other fish pens, the Aquapod is designed to be used in high energy open ocean conditions that eliminates many of the near shore issues often associated with fish farms. Further the use of coated steel mesh instead of netting virtually eliminates the risk of escapment and predation by other ocean inhabitants. Visit our website (www.oceanfarmtech.com) for more information. I also encourage those interested in this type of sustainable open ocean aquaculture to check out www.oceanstewards.org .